In collaboration with Expedia and their #WorldonaPlate Challenge. It’s funny how our tastes change as we grow up. My childhood diet was quite limited – baked meat and mashed potatoes being the staple, supplemented with seasonal wild fruits harvested ourselves (one wild strawberry for the basket, three for me!). I was very reluctant to try new things. I remember my teacher serving honeydew melon slices in Home Economics class, and my being truly revolted at the taste and texture. Now, I love trying new things! Experiencing new flavours is all part of the adventure of life, isn’t it? So just imagine my delight when a hamper (18 kilos in total) of Bulgarian produce arrived on my doorstep one day, with a challenge from Expedia – here Elizabeth, cook something Bulgarian with all this awesome stuff! The hamper contained a wide variety of dried meats such as cured game sudjuk and pastarma manastirska ‘nashe selo’, cheeses including buffalo’s milk yellow cheese, strained yogurt with cheese and a white sheep’s cheese, Bulgarian wine, pastas and jarred sauces, preserves such as rose hip jam and something that’s got figs in it, sweets and biscuits, tea, dried rose petals, 1 kg pickled cabbage leaves (a genius idea – looking forward to making cabbage rolls with these! ), vine leaves stuffed with rice and a package of phyllo pastry. I confess I have absolutely no experience of Bulgarian food whatsoever, except for the few meals I’ve shared with a dear Bulgarian friend of mine over the years we’ve known each other. 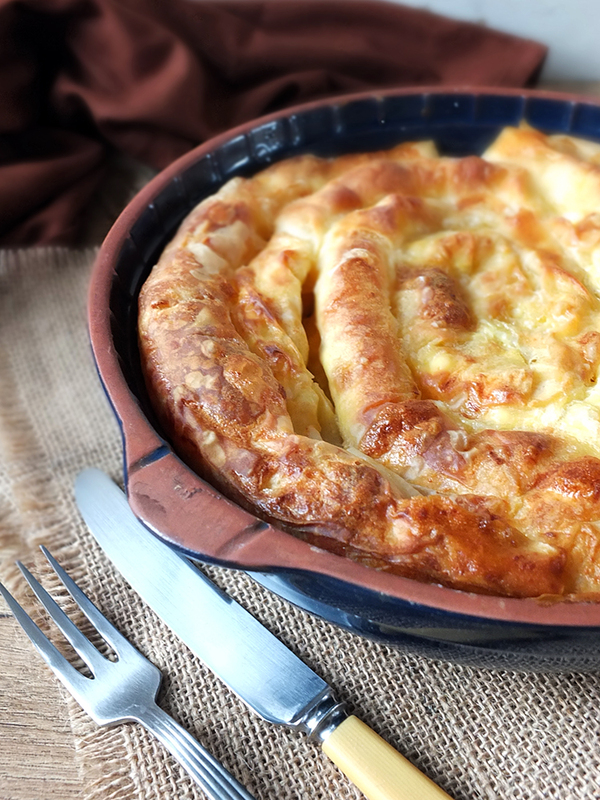 My friend tells me that banitsa, a popular white cheese, yoghurt and egg pie made with phyllo pastry, is made for any special occasion in Bulgaria: wedding, funerals, guests coming to visit, etc. Traditionally you must have bantica’s kusmeti/ good luck messages attached on budding twigs – small pieces of paper you write a wish on for Christmas. The dishes on Christmas Eve, which all Bulgarian’s celebrate, are vegetarian and banitsa is always present together with baklava (which she says is the best dessert ever!). She says that Bulgarians can buy and eat banitsa for breakfast just like the French eat croissants. She never follows a recipe when making it, preferring, like most Bulgarians, just to make it up as she goes along, so she couldn’t give me one, but I found two online here and here which I used. Banitsa can also be stuffed with meat, rice, spinach or even with pumpkin and sugar for a sweet option. 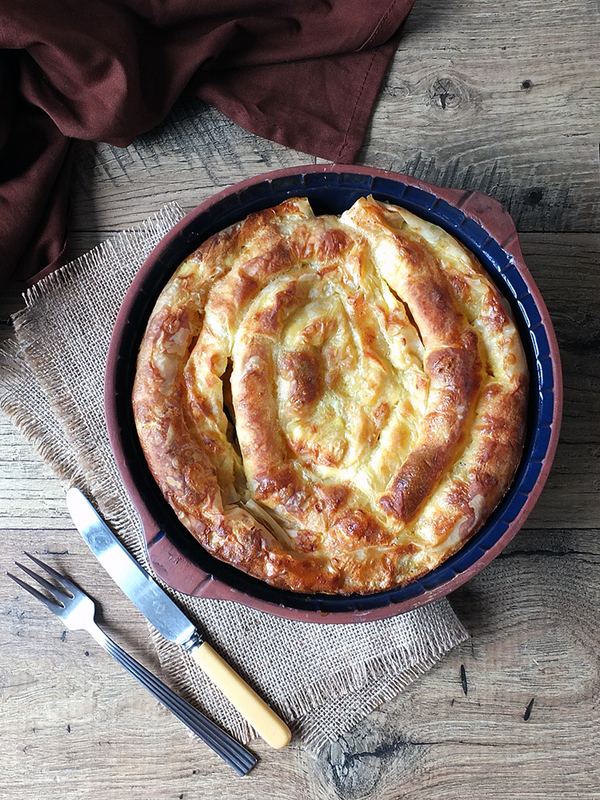 Banitsa is a remarkably simple recipe to make. All you do is mix the ingredients, sprinkle it over some ready-made phyllo pastry, roll, arrange in a dish in a spiral shape and bake! It also tastes fantastic! 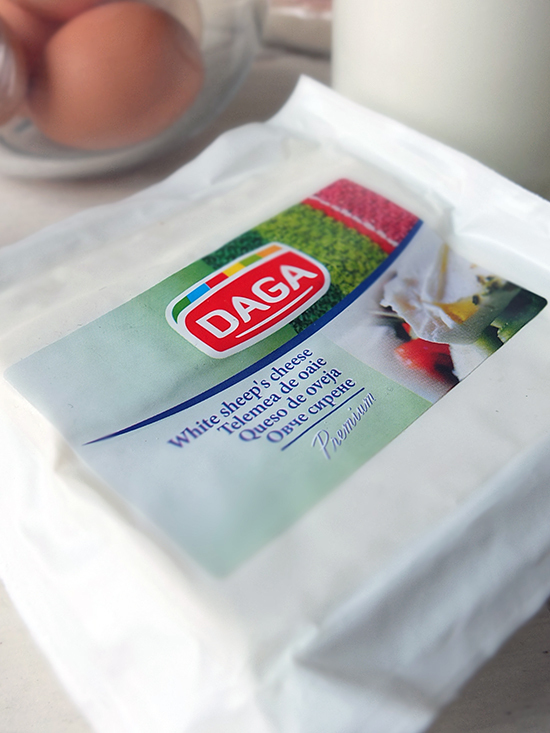 The sharp Bulgarian sheep’s cheese is just like feta cheese, with a fantastic flavour. 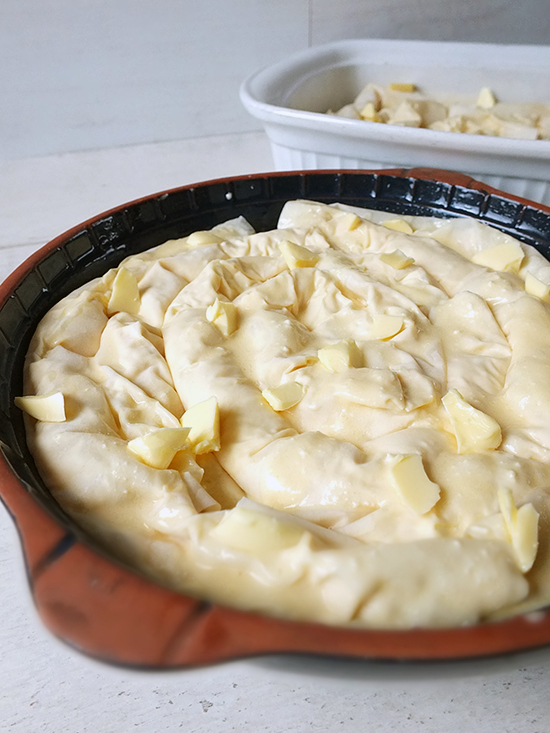 The eggs soak into the phyllo pastry and it all puffs up gorgeously while baking to make a perfectly slice-able pie which will keep for a few days in an airtight container. 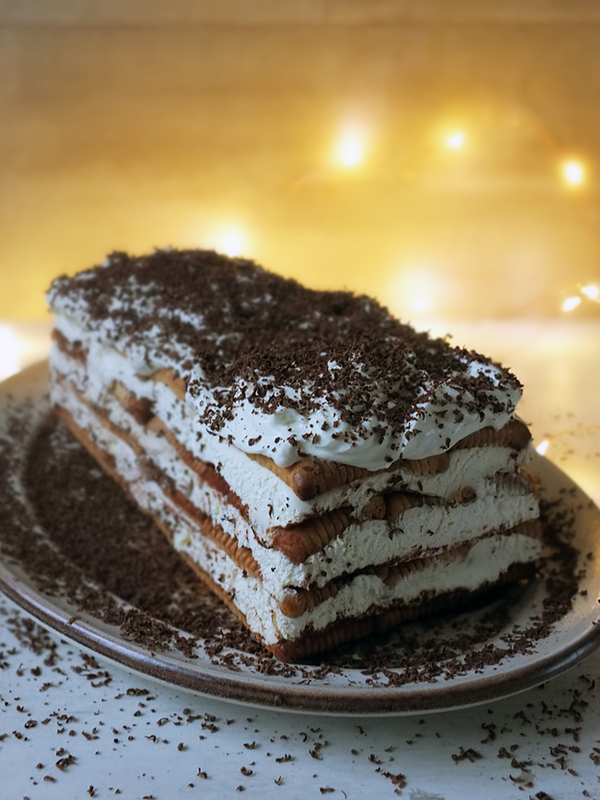 I also made another popular Bulgarian recipe with the ingredients I was sent – a biskvitena torta – a Bulgarian biscuit cake. Trying to source a recipe online was proving to be rather difficult, so again, like my Bulgarian friend said, I just sort of made it up as I went along combining this recipe and this recipe using the Torta cake biscuits which were included in my hamper. 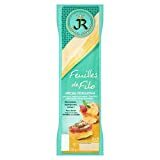 These biscuits, not unlike ladyfingers, were soaked in milk and layered along with 300 ml double cream whipped with 2 tbsp icing sugar, and 250 grams of mascarpone cheese. The creamy layer was sprinkled with cocoa powder before topping with more soaked biscuits and left overnight to chill in the fridge (in a bread tin lined with cling film to ease removal). The next day I tipped the cake out, topped it with the remaining cream mixture and ground some dark chocolate over the top. The recipe I made wasn’t terribly sweet, but it was rather unusual and delicious. I think if I was to make this again I’d use more icing sugar. Also – this photo was taken at 11:30 am on the 16th of December. See how dark it is in the middle of the day here! Impossible for food photography! My Bulgarian friend remembers that her aunt used to be a superb torta maker and when she and her siblings were children they were eager to visit her. Her torta/cake took quite a bit of effort to make though. When my friend was a teenager every Friday afternoon she would meet with friends and bring a cake of biscuit and custard layers or sweet salami. They would eat this later on during their Friday music party or kupon in Bulgarian. They would gather up listen to cool music such as Pink Floyd, Cream, The Beatles, or The Band and eat cake and sometimes pass around a bottle of white or red wine to share amongst all. They would also sing and play guitar and have long philosophical or political discussions. It was a special time of change for Eastern Europe 1989-1991, she recalls. Have you visited Bulgaria? Do you have any interesting food stories to share? Let me know in the comments! A staple dish in Bulgaria which can be eaten hot, warm or cold. Preheat your oven to 190 C/ 170 C fan. Lightly grease a 9 inch pie plate and a 9 x 13 casserole dish with a little oil. Crack the eggs into a medium sized bowl and lightly beat them. Crumble the white cheese onto the top and stir in. Add the yogurt, oil and water and combine well. 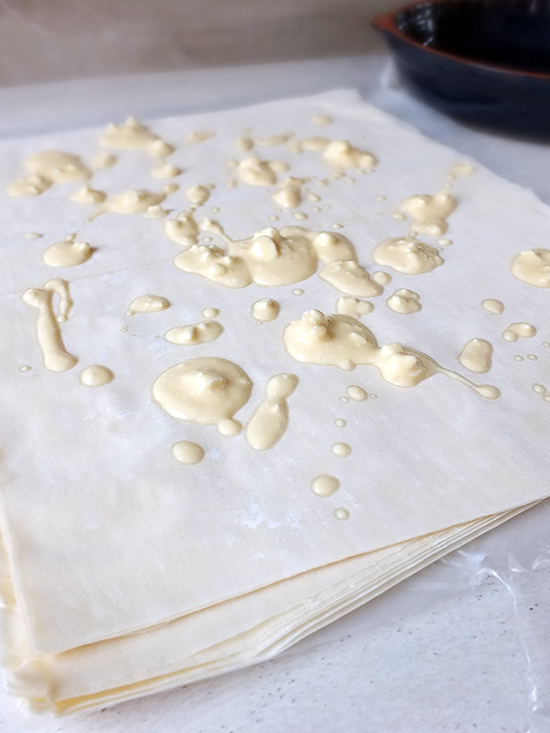 Unroll the phyllo pastry, and working with one sheet at a time lightly drizzle three or four dessert spoons of the egg/cheese mixture over the top. You don't want to saturate the pastry, just sprinkle it. I then used my hands to distribute the mixture evenly across the pastry dough. Loosely roll the sheet of phyllo pastry up like a log and place into your prepared baking tin in a spiral shape. Repeat with the remaining layers of pastry. If there is any mixture left, drizzle it over the top of the rolls of phyllo. Dot with butter and bake for 45 minutes, until golden. Leave to cool for 20 minutes before slicing. Serve with extra yogurt. Leftovers can be kept in an airtight container at room temperature for 2 to 3 days. Do not refrigerate as this will cause the pastry to go soggy. 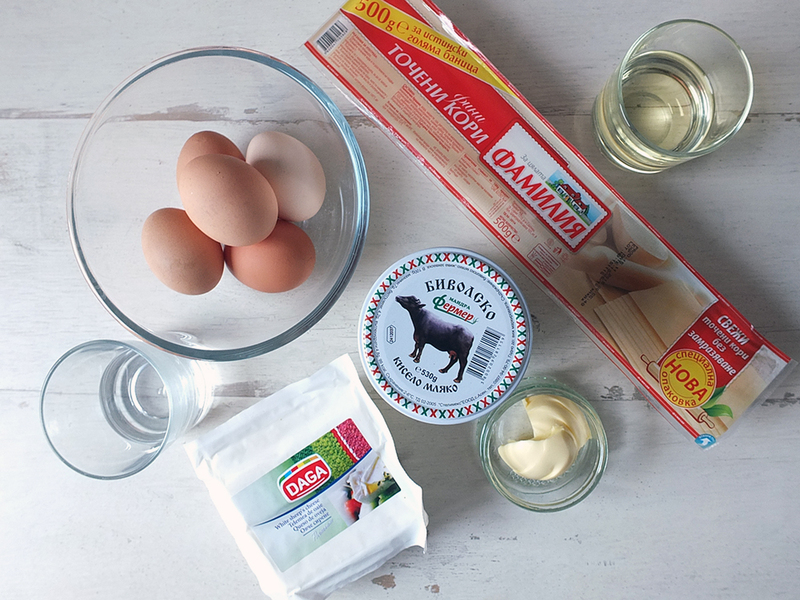 Elizabeth’s Kitchen Diary received a hamper of Bulgarian food and a supermarket voucher to help with the cost of ingredients for this recipe post. This post is in collaboration with Expedia and their #WorldonaPlate Challenge. I am half Bulgarian and I grew up eating this. I love Bulgarian cuisine! My husband and I spent over a month in Bulgaria while adopting our son and wanted to keep his culture alive so we made a “traditional” Christmas Eve dinner which of course, include the stable, banista! 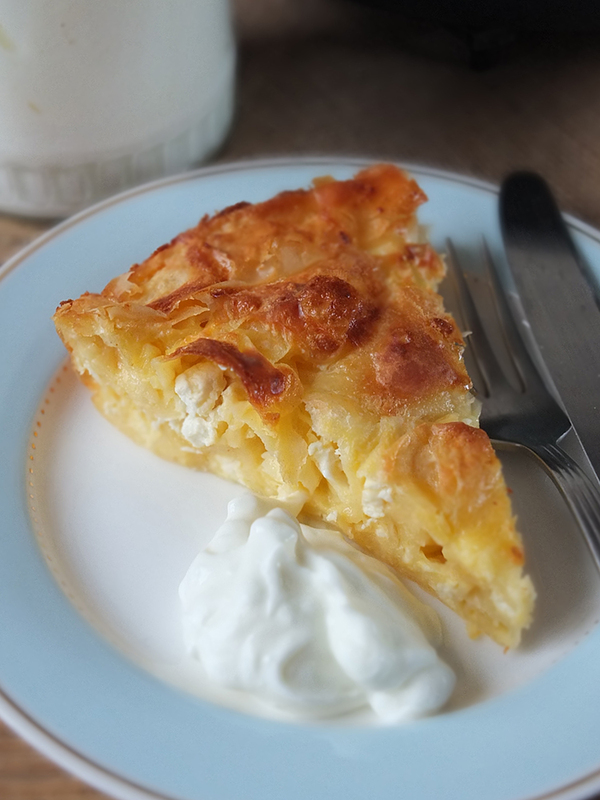 This recipe is excellent and the closest I have come to what we had while in Bulgaria. First, the yogurt is absolutely crucial. Banista is not made with milk so if you see a recipe calling for it, it’s the wrong recipe. 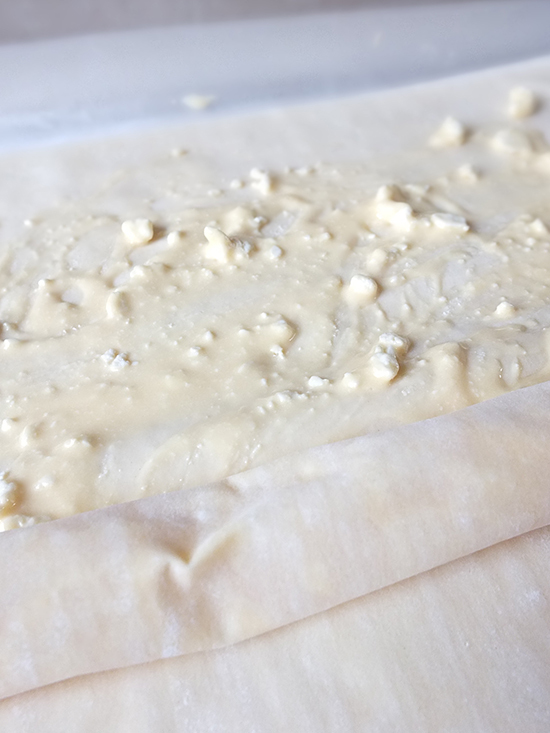 I made a few modifications to the recipe: I used 5 phyllo sheets per roll (I don’t think this was noted in the recipe). I would take the oil down by 1/4 of what it calls for. I used a spring pan and it was perfect and allowed for perfect presentation. I prepped ahead of time and cover with parchment paper, then two moist paper towels, cling wrap and stored in the fridge for 5 hours. I let stand for about 1/2 hour before cooking. Covering for the 20 mins afterwards is crucial and was perfect. I wish this allowed for pictures to be uploaded. It came out beautifully and all of us loved it. Definitely a keeper recipe! Will be adding spinach the next go round. Happy trying! How funny that I have come across your post. I have been reminiscing of my time spent living in Bulgaria and how I am hankering for some banitsa. I did not learn how to make it while I lived there, but the photos of how your came out look quite close to what I remember eating. 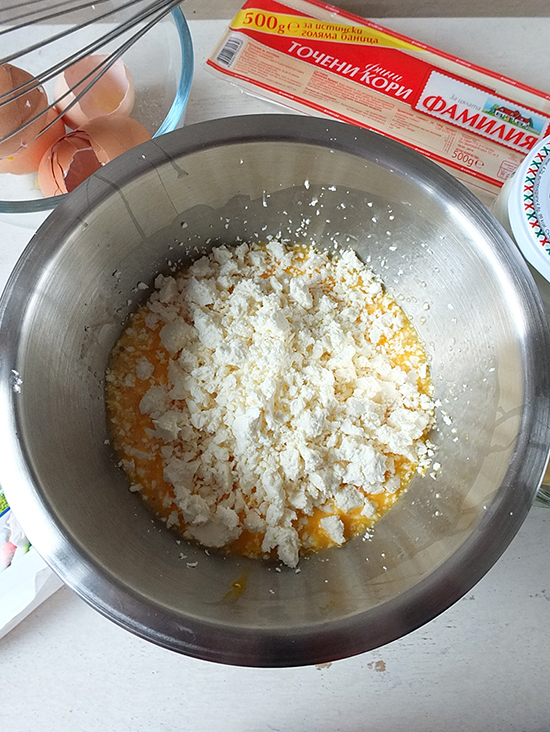 And yes… we would eat cirene and tikvenik (pumpkin) banitsa for snacks, breakfast and dessert… 🙂 Thanks for trying out the recipe and I will have to try it out myself! Oh my! This looks seriously scrum-diddley-umpsious! I love cheese! Harriet from Toby & Roo recently posted…Little boy’s hair cuts : Should we force them? This looks interesting and different! I’ll have to show my wife and try to adapt some of the ingredients! It looks and sounds delicious but I will have to try this with Feta as my local Sainsbury’s don’t stock Bulgarian sheep’s cheese ! Banitsa makes a fabulous looking top crust. Mmmm. 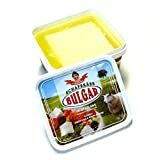 I have never tried any Bulgarian food – am totally clueless as to what it would be like. But that looks extremely tempting. I think I might have already commented on this one but I love it so much that I am coming back to it twice.I am obsessed with cheese so this would help fuel my cheese addiction lol. Just a little bit jealous of that huge hamper. 18 kilos is an insane amount of food 🙂 I also don’t know a lot about Bulgarian food but you’ve done the hamper justice. This pie sounds divine – definitely something I would like to try myself. I’d love to find out more about Bulgaria and it’s cuisine now! What a wonderful and original cheese reat; thanks so much for sharing this great recipe! What a gorgeous and delicious looking cheese pie! I can totally imagine this with spinach in it, for brunch or lunch. Oh my, I must make your recipe! This looks absolutely amazing. I’m always searching for unique recipes to try and this totally made mynlist! Thanks for sharing! This cheese pie looks too good! Love it! Yum, this looks so good 🙂 Perfect for a holiday gathering. Come and visit! 😀 You’re more than welcome to join me at my table any time. It’s a journey to get here, but one I think everyone should make at least once! I’ve never had Bulgarian food but your post makes me want to! This looks quite delicious and simple too – pair with a salad for a perfect meal! This looks absolutely delicious and a must-try for me! Layers of cheesy-liciousness in every bite – yum! Elizabeth recently posted…Save Pennies with these 39 Credit Crunch Munch Recipes! I am 100% sold on this recipe, looks divine!! Since Bulgaria is so close to Greece I can tell you that this pie looks exactly the same as the ones they make in the northern parts of my country and it is delicious! You made one fine cheese pie! Wow, I don’t think I’ve ever heard of a bulgarian cheese pie. It sure does look delicious! 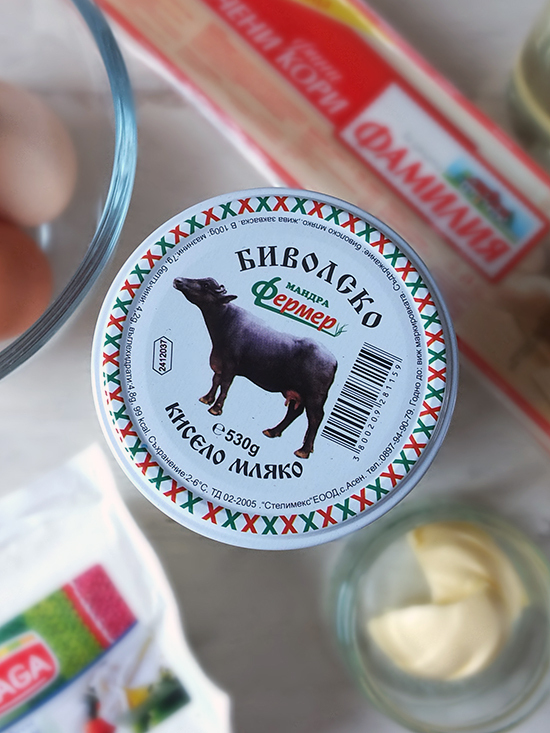 I’d never heard of it either until I started researching Bulgarian food for this post. So glad I’ve tried it, and I’m definitely going to be experimenting with variations! I’m amazed that something that gorgeous takes so little effort! I’m thankful for premade phyllo sheets! I love this! Love all the layers of filo and cheese… a cheese lovers dream! I love the sound of this! Such an amazing hamper of Bulgarian food and it sounds as though it got you all creative! Ooh my what a fab hamper. And I love the recipes you’e made with it. I’d be very happy to eat both. I quite like the idea of the not too sweet biscuit cake as I often find cakes and puddings just a bit too sweet. I know nothing about Bulgarian food, or at least I didn’t. It sounds a bit similar to Greek. The more I read and hear the more Greek the dishes do sound. I suppose each country is influenced by its neighbours! That’s just gorgeous Elizabeth. My first temptation would be to make it Greek and add Spinach lol! Always trying to add those greens. Bet it’s tasty just as it is though. Oh and love your new banner too. Oh yes, the addition of spinach would be a great idea!!! yum! Well, this looks like a little bit of heaven on a plate. Delish! How fun! I love trying new things like this. My Grandma used to make something like this using, what she called, Farmer’s Cheese. I would love to try this! pinning to make later. Thanks! Emily recently posted…no bake christmas crispies. It’s definitely a good pairing, and so easy to make too! Looks so delicious and indulgent 😀 Yum! Cheese and pie are two of my favourite words, so even better when they are put together. I did a Maltese recipe for the World On A Plate challenge and I really enjoyed discovering more about Maltese food. It’s a great challenge to be part of, isn’t it! Thanks Lucy, and wishing you all the best for the festive season and the new year! It’s so easy to make too. Let me know what you think if you do make it. I’d never seen anything like this before either, but I was so surprised at how easy it was to make and how tasty the results were! Yum! This all looks like fun baking and what an awesome parcel to receive! 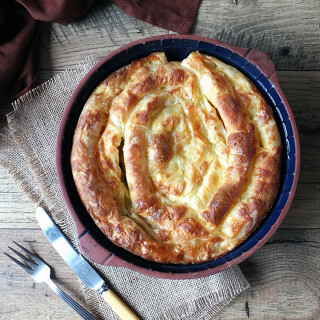 The Banitsa pie reminds me – unsurprisingly – of a turkish dish, which I’ve been meaning to try for ages! Sounds delicious, how interesting that Christmas eve is a veggie affair too, I wholly approve of that! Rachel recently posted…Sunday Musings: My Most Favourite Country Of All! It definitely was an amazing parcel. We saved the wine for Boxing Day when we had guests over – such a lovely wine too! Wishing you all the best for the new year!